You get younger looking skin because of the delivery of active ingredients. Research shows that antioxidants help protect, renew and regenerate damaged cells, wrinkling and premature aging of the skin. Immune Perfect has a whole product delivery system, meaning the delivery system itself is active and helps fight the oxidation caused by UV rays and environmental pollutants. This delivery system is a cosmetic industry first. Fine lines and wrinkles above and below the eyes have several causes but first is the need for hydration at a cellular level. Firm and tone the eyelids and the jaw line with active hydration that penetrates where it is needed. You will begin to reduce the appearance of fine lines and wrinkles immediately. 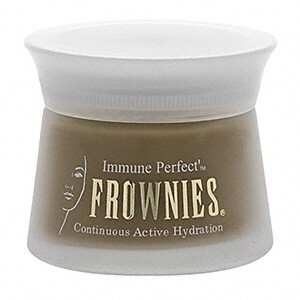 Immune Perfect gel-cream liquefies immediately on contact with the skin. This allows instant activation with the cellular layers of the skin so that cellular renewal is immediate. Continuous active hydration and a supply of beneficial nutrients help keep the skin and cellular layers hydrated. You see the results of your skin correcting the damage caused by UV rays, color cosmetics and harsh chemicals. The powerful delivery of free-radical scavenging nutrients, through the skin, helps to rebuild, and prevent the conditions that cause wrinkling, and further cellular damage. Powerful, antioxidants will help the skin reduce irritation and inflammation, helping to regulate skin tone and texture. You can trust Immune Perfect to help reduce the signs of skin damage and premature aging. Frownies natural skin care products are the perfect alternative to BotoxÂ. Used in combination, Frownies Facial Pads and Immune Perfect are a complete facial wrinkle reducing system.